Thursday February 20th 1896 The weather was still cold. I did the housework and worked on my mat. The boys were all down town in the afternoon. Seth took down some wood. It was 51 years today since Father and Mother were married. Friday February 21st 1896 I baked cake and pies this morning and Will churned for me. The boys all went to town in the afternoon and I worked on my rug afternoon and evening. weather a little more moderate. Saturday February 22nd 1896 I got my work done early and Will and I went down to the church to a turkey dinner. I did a little shopping. We got over home before one oclock. Ott & Fanny are at home. Lee seems better. We come home before four oclock as it began to rain. Seth took in his loads of wood today. The boys went down town after supper. I worked on my run till late bed-time. 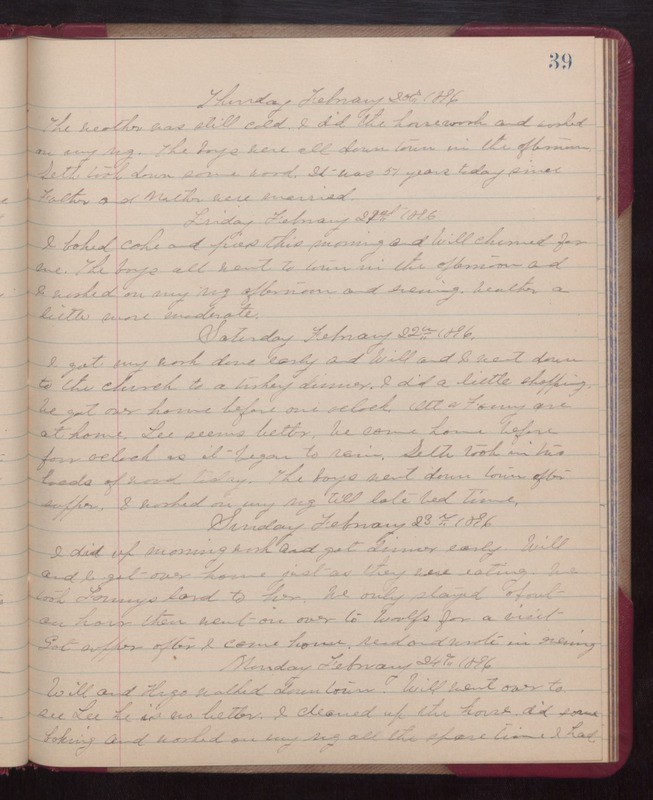 Sunday February 23rd 1896 I did up morning work and got dinner early. Will and I got over home just as they were eating. We took Fannys lard to her. We only stayed about an hour then went on over to Woolfs for a visit. Got supper after I come home, read and wrote in evening. Monday February 24th 1896 Will and Hugo walked down town. Will went over t see Lee. he is no better. I cleaned up the house, did some baking, and worked on my run all the spare time I had.